 Ausf is the general term used to cover "model" or "mark" in showcasing a variant. 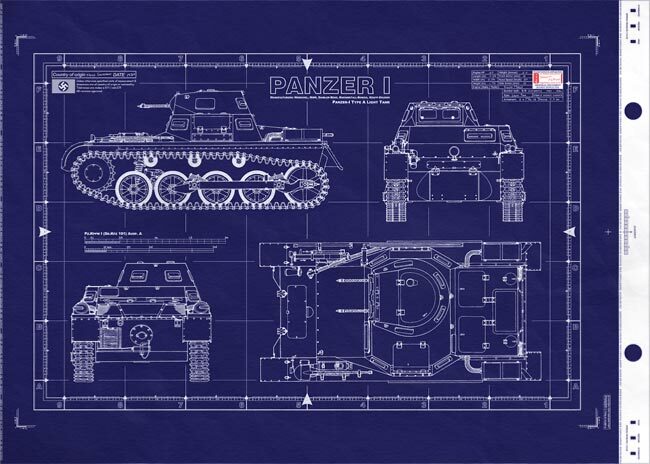 Panzer I Ausf A - This is a real blueprint made directly from vellum masters. Delivered to you on a full size master sheet measuring 42"x 30". 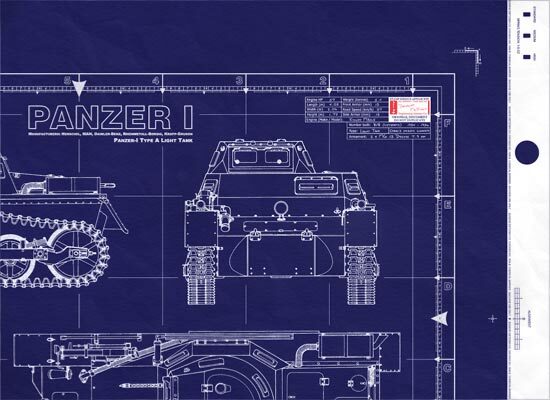 The Panzer I name is short for the German Panzerkampfwagen I (armored fighting vehicle mark I), abbreviated PzKpfw I… The tank's official German ordnance inventory designation was SdKfz 101 (special purpose vehicle 101). Continued from above… weighing about 5000kg (11,025 lb) that could be used for training purposes, and five companies subsequently built prototype vehicles. 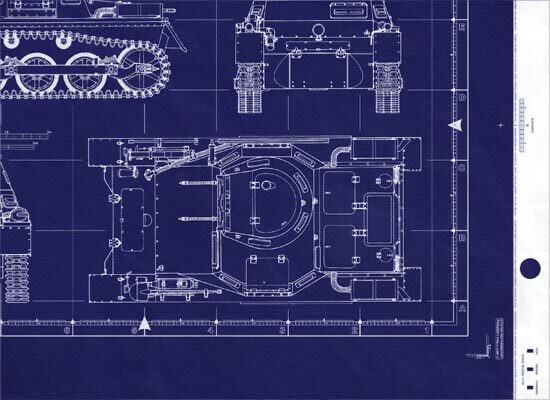 After trials the Army Weapons Department accepted the Krupp design for further development, the design company being responsible for the chassis and Daimler-Benz for the superstructure. To conceal the real use of the vehicle the Army Weapons Department called the vehicle the Landwirtschaftlicher Schlepper (industrial tractor). The first batch of 150 vehicles was ordered from Henschel, and production commenced in July 1934 under the designation PzKpfw I(MG) (SdKfz 101) Ausf A and powered by a Krupp M 305 gas engine developing 57 hp (42 kW). Originally known as the MG Panzerwagen (armoured MG carrier), the PzKpfw I Ausf.A was the first German tank to go into mass-production. This tank was a straightforward machine with no unexpected characteristics or technical devices. It was 13 ft. long and weighed 5.4 tons, with a crew of two men. It had welded turret mounting two coaxial 7-92-mm. MGs in an external mantlel and no special provision was made for observation by the commander who was perforce the gunner as well. The drive was taken forward to a five-speed sliding pinion gearbox and thence through cross shafts, carrying on each side a clutch and brake steering system, to the front driving sprockets. Several machines were fitted with the Krupp M 601 CI engine which developed 45 h.p. at 2,200 r.p.m., but the experiment proved unsuccessful and the Krupp petrol engine was used in all production models of the Pz Kpfw I A.
Krupps original prototype had four suspension wheels with a rear idler touching the ground: movement of the wheels was controlled by coil springs and three return rollers were mounted on the hull. The layout was changed in the production models which had an external girder covering the two rear suspension wheels. The ends of this girder were connected to the axle of the second suspension wheel and to the rear idler wheel axle by forked links carrying J elliptic springs whose tips rested on the axles of the third and fourth suspension wheels. Movement of the leading suspension wheel was controlled by coil springs and three return rollers were mounted on the hull. The suspension was reasonably satisfactory at low speeds but pitched badly when the tank was moving faster, probably accentuated by the rear idler wheel which was in contact with the ground. 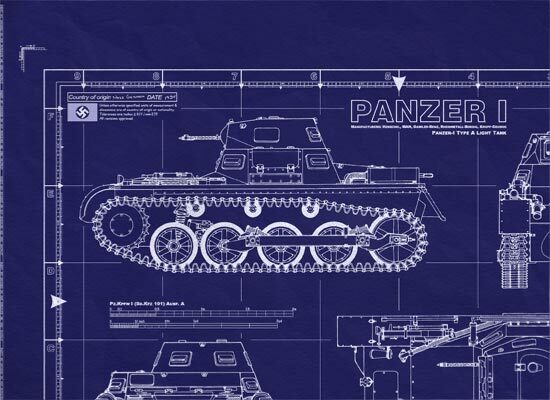 The outside girder appears in almost all original light tank designs whatever the country of origin. While it simplifies design to some extent it offers much additional drag in soft going and is vulnerable to hostile gun-fire. In practically every instance it disappears after the first batch of tanks, but in this instance it was used in the IA and IB and is included in the first two versions of Pz Kpfw II. Pz Kpfw I in all models used a single-pin skeletal track, having two guiding horns on each plate between which ran the suspension wheels: track plates were 10 in. wide. The superstructure was built out over the tracks with the turret mounted offset to the right side. This allowed room for the driver's access hatch in the left side and roof of the superstructure. Both machine-guns were mounted coaxially in the turret front in an internal moving gun mantlel. Although there were only two crew members, five vision ports were provided in the superstructure and six in the turret. The original design did not provide adequate ventilation with the result that the air-cooled engine overheated. To reduce this problem, an 'air-scoop' type of louver was added to the rear deck, and two scoops were added to the rear to deflect the exhaust air. A Krupp M 305 four-cylinder gasoline engine was used which developed 57 h.p. at 2,500 r.p.m. and was housed in the engine compartment at the back of the tank together with a large oil cooler. Five firms were selected: Rheinmetall Borsig, Daimler-Benz, MAN, Henschel and Krupp, who were invited to submit their proposals for a machine to meet the requirement. After close and detailed examinations, the Krupp model LKA1 design was selected for the chassis, which was based on the imported Mk VI chassis. Daimler-Benz were to construct the turret and the hull. To ensure secrecy, the machine was named " Landwirtschaflicher Schlepper " (agricultural tractor), abbreviated as La S. Full-scale production began in 1934. The Panzerkampfwagen l was first used operationally in the Spanish Civil War, and at the start of the invasion of Poland in 1939 no less than 1,445 such vehicles were on strength. It had already been realized, however, that the vehicle was ill-suited for front-line use because of its lack of firepower and armor protection (7-13mm/0.28- 0.51 in), and in the invasion of France in 1940 only 523 were used, although many more were still in Germany and Poland. By the end of 1941 the PzKpfw I had been phased out of front-line service, although the kleiner Panzerbefehlwagen I (SdKfz 265) command model remained in service longer. Once the light tank was obsolete its chassis underwent conversion to other roles, and one of the first of these was the Munitions-Schlepper used to carry ammunition and other valuable cargoes. For the anti-tank role the chassis was fitted with captured Czech 47-mm anti-tank guns on top of the superstructure with limited traverse, These were used on both the Eastern and North African fronts, but soon became obsolete with the arrival of the more heavily armoured tanks on the battlefield. The first complete PzKpfw I Ausf.A were issued in September 1934. By July 1935, the Kraftfahrlehrkommando had received 475. As new Panzer units were formed around cadres drawn from older units, and because the cadres took their pz Kpfw I Ausf A with them as training vehicles, by the beginning of the war, the Ausf A was scattered throughout all the Panzer units. The PzKpfw I was used extensively in Poland and France, and took part in the invasion of Denmark and Norway. From late 1940 until 1941, the Ausf A was withdrawn from units in the main combat areas. Its final service was in Finland in 1941, and in North Africa. The Chinese Government at Nanking (Central Government of China 1911-1949) placed an order of 15 Panzer Ia in mid-1936 and those tanks were delivered in mid-1937. At the beginning of the Sino-Japanese War, Panzer Ia were in the position for defense of Chinese capital city, Nanking. However, after the battle of Nanking in late 1937, all Panzer Ia were abandoned at the off shore of Yangtze River since the retreating Chinese troops lacked tug boats for those tanks retreat. Eventually, nearly all Panzer Ia that were in Chinese hands, were captured by Japanese troops and most were shipped to Japan for public exhibition and armament research. The turret is of horseshoe design, with flat front, the sides and rear being one rolled plate. The superstructure is octagonal with driver?s vision port on the left side of the front plate. Pistol ports are located on three corners of the fighting compartment. An exhaust silencer is placed on each track guard to the rear. The suspension consists of four rubber-tired bogie wheels, adjustable trailing idler, front sprocket, three return rollers and outside center-guide steel track with dry pin. The idler and rear bogie wheel are paired to articulate on a stub axle. The two center bogie wheels are paired also. Quarter elliptic springs, assisted by a coil spring, absorb road shock. The front bogie is independently mounted and resisted by a coil spring plus a luvax shock absorber. Both articulating bogies are connected by a steel girder. From the engine the drive is taken to the propeller shaft to the clutch, thence to the crash-type transmission, which is mounted forward on the right of the driver. There are 5 speeds forward and one reverse. From the transmission the drive is taken through a bevel gear box to steering units of the clutch and brake type on each side. The two steering levers are each provided with two grips, one for normal steering and the other with thumb plunger which operates a ?fly-off? type catch for holding the levers back and thereby providing a parking brake. No normal hand brake is fitted. From the steering units the drive is taken via two rubber disc-type universal joints to the final drive reduction gears, mounted inside the hull, to single sprockets driving from the front.